ADVANCED PROFESSIONAL OBDII READER - LIVE DATA! Advanced OBDII Reader is the fastest way to diagnose your vehicle - Save Time and Money! CAN or Controller Area Network is the latest communication protocol. This protocol started being used in 2003 on some models and all cars starting in 2008 are required to use this protocol for communication. This scanner will work with these cars! Watch out for cheap scanner's which don't! - Quickly understand the issue with your car, repair the problem yourself or simply know what the issue is before you take it to a mechanic. No surprises no extra costs can be pushed on you from the mechanic. This tool will run a number of self checks to monitor the health of your vehicles emission system. It can help you get through emissions and shut off emission codes that pop up randomly. It's true, this device can read the VIN number of the vehicle its connected to. If your shopping for a car it would be a good idea to make sure the computer has never been changed or the vehicle is true to its body's VIN number. Views OBD-II freeze frame data, scans, records and plays back live data. Stores up to 38 scans. Compatible with 99% of vehicles 1996 and Up! OBD means on board diagnostic. This was started in 1988 to monitor the emissions coming from your vehicle. 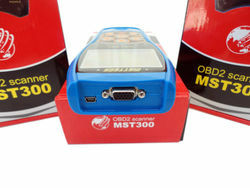 The OBDII was developed to expand the OBD technology. The OBD computer monitors the engine, emission system and performance. If a malfunction happens it will release a code into the system. You use this OBDII reader to pull the code. Does my car have OBDII? 99% of cars after 1996 will have OBDII. This means all 1996 models will have OBDII. All petrol cars sold in Europe since 2001 and diesel cars after 2003 also have a diagnostic system. * There are free online websites to view code data. We highly recommend searching google for your code and finding answers why it may be on. great reader! advanced features and large display.